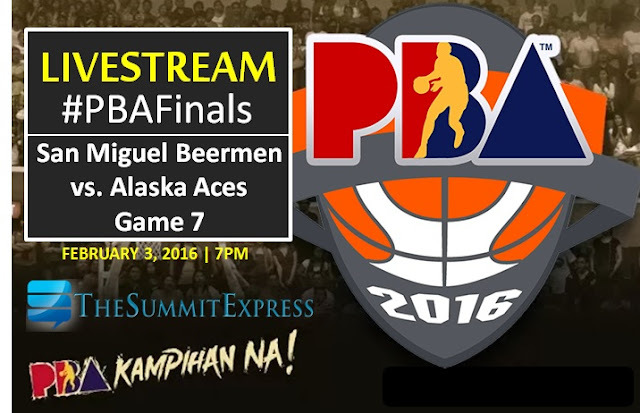 MANILA, Philippines - The historical clash between San Miguel Beermen (SMB) and Alaska Aces in the 2016 PBA Philippine Cup Finals Game 7 is set to happen today, February 3, 2016 at the Mall of Asia Arena. Get the latest updates through free livestream video which is now available on this page. TV5, the official licensee of the PBA will bring Game 7 live streaming online for the winner-take-all match. San Miguel is looking to be the first team in PBA history to win a crown after trailing 0-3 while Alaska aims to be the first franchise to salvage the championship in Game 7 after blowing away a 3-0 lead. SMB big man June Mar Fajardo is expected to give confidence for his team to win the crown. “June Mar will be able to recover. He’s only about 70 percent (of his old playing condition). He may be 85-90 percent by Game 7. So it’s good for us,” said SMB coach Leo Austria moments after Game 6. The Aces are eyeing their 15th league championship and first Philippine Cup since 2000 while the Beermen are hoping for back-to-back PH Cup championships and their 22nd overall.